I’ve been noticing strange numbers written on the walls outside of most apartment doors, and only recently learned what they mean. 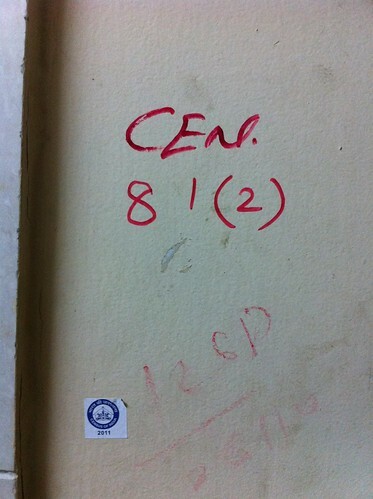 Apparently it’s census data, marking the number of occupants in an apartment by physically writing on their wall and attaching an official stamp. In the The States, people would definitely freak out about someone writing on their wall, but I imagine there would also be concerns about the privacy implications of broadcasting how many people live at an address. These kinds of practices are normal here though, perhaps because there are so many people with no standardized national ID system. The physical, local, and ad-hoc solution tends to win out. Another example of this is what I’ve learned about voting in India. Apparently when you cast your ballot you are marked on your fingernail with permanent ink. It’s a physical way to avoid double voting and will grow out before the next election. It also has the same privacy issues since it broadcasts to everyone whether or not you voted. I’m keeping an eye out for more examples that fit with this kind of pattern in India. Let me know if you’ve heard of others. It’s been raining for well over 24 hours now. I’m not sure exactly when it started since my flight landed yesterday in a downpour and it hasn’t let up since. I took the opportunity to have an inside day, the first since I’ve been here that I didn’t leave the house at all. It might also be because this is the first day I’ve lived alone; A. and M. moved to their new apartment and R. doesn’t come for another couple of weeks. In Chicago I’ve gotten very used to living alone. It can be good to stay with other people since everything is so new here, but in such a crowded city it’s also nice to have an option for solitude. I spent most of the last week in Gurgaon, a suburb just south of New Dehli, which is quite different from Bombay. I’m not a fan of suburbs in the US, and the distaste extends to India. Gurgaon is full of office buildings, hotels, and malls. I was shuttled between the three in a car and never even got a chance to walk the streets. The hotel experience was pleasant enough, but in a global kind of way where I could have been anywhere in the world if it wasn’t for the idlis at the breakfast buffet. It made me feel lucky that the IDEO office is in such an interesting neighborhood. If I had gone into Delhi I would have most likely seen the giant rallies in support of Anna Hazare, a Gandhian who has been fasting in support of creating a strict anti-corruption law called a Lokpal. Giant crowds have been a constant presence in the city, and smaller marches have been happening all over the country. In Mumbai they were prevalent enough for me to have a small faction pass directly under my apartment last week. Just now, breaking news, the parliament has given in to his demands and he plans to break his fast in the morning. It will have lasted for 12 days, which is amazing considering that Anna is 74 years old. On Friday we drove to Jaipur, which we thought would take 3.5 hours but ended up taking six. The drive took us through towns and villages, good roads and terrible. Most of it was in Rajasthan, an Indian state I’m thinking about spending more time in when I take a vacation in October. For me, one of the more noticeable and interesting aspects of the drive were the camels. They were being used mainly like horses, pulling carts or equipment. I guess they’re very common in that region, which has large desert on it’s western border with Pakistan. I just put some new photos up on Flickr, but I’ve accumulated a bit of a backlog that I still need to share. I while ago I switched to shooting only RAW images, which gives me a lot more flexibility in how I can manipulate them after shooting, but requires that I “develop” each one since a RAW image is sort of like a digital negative that needs to be worked with. I’ve always been reluctant to shoot in RAW since the images are 4-5 times the file size and require the extra processing step. I’m a complete convert now though, and I wish I had tried it sooner. It’s amazing what you can do afterwards in Lightroom, rescuing an over- or under-exposed photograph that I would have been scrapped before. It’s also fun to do the developing, to consciously study each photograph and work through the possibilites. It has some of the positive aspects of the traditional darkroom, without worrying about mixing the fixer wrong. India has the most lively street food culture I’ve ever witnessed, though I’ve been too nervous to try any of it until I’m sure my stomach can handle it. On Saturday I went to a restaurant called Swati Snacks that is known for serving all the street food favorites in an sanitary manner. It was seriously good, so I’ll definitely be going back. I had the Panki Chatni, which is a thin rice pancake served between banana leaves, and a Vada Pav, which is the most famous Mumbai street food, composed of a spiced potato patty served on a bun. The former was delicious and light, the latter was good but maybe a bit too much carb-on-carb (even for me!). I can see why it’s popular on the street in terms of calories per rupee. Sorry for the poor photo quality, these were quick iPhone snaps. Food here is also tricky, because there are so many restrictions within the various cultures that make up India. A great example of this is the image below: a drop-down menu to select your food preference on a Indian airline. I feel confident in saying that United could never handle this kind of complexity. It’s an old adage that in a city, life happens on the street. Never have I witnessed that phrase in such a literal manner as in Mumbai. Commerce of all kinds, socializing, eating, playing, praying, and sleeping happen either in the road or in structures that are as much outside as inside. There are of course Mumbaikars who live in the exact opposite manner, existing almost entirely inside their apartments, offices, restaurants, or vehicles. They experience the street mainly as congestion as they shuttle between these air conditioned environments. These are extremes, and most people probably live somewhere in the middle. Still, it’s something I’ve been reflecting on because it’s impossible not to notice the difference between inside and outside space here. I’ve been trying to understand both by choosing to walk whenever I can. The street can be hot, wet, dirty, smelly, and crowded. Inside spaces are often cool, clean, modern, and (relatively) quiet. It’s a frequent commentary on Mumbai that rich and poor are intermingled and on top of each other, but to see firsthand how it plays out through inside and outside has been interesting for me. As an aside—you can actually find small patches of quiet, clean, and peaceful outdoor spaces in the parks. I’m lucky enough to have one directly next to my apartment. They usually have playground equipment, grassy areas, and a walking path for people to get exercise without the constant stress of avoiding traffic. They accomplish this through a small admission charge, usually Rs.2, which is under 5 cents. It feels odd, getting used to this urban fabric. To spend an afternoon reading and drinking cappuccino at a coffee shop before walking home amid honking, holes, trash, heat, and mess. To see a man getting a shave while crouched in the dirt next to an upscale bar. To have all of my senses overloaded to a breaking point before slipping into a quiet movie theatre and enjoying a bucket of popcorn in the stadium seats. Even though some of the adjectives I’m using seem unappealing, I truly enjoy the street here. It’s where things are most different from what I’m used to and where I’m surprised every minute. One of the disappointments though is the general approach to trash. I’m not in a position to assign blame, so these are simply observations. People of all classes and status litter constantly. From tossing food wrappers into the gutter to throwing the cob of a finished ear of corn into the sea. The problem is compounded, or maybe even encouraged by the lack of public waste bins or a system to empty them. I see garbage trucks scooping heaps of trash into their compactors by hand, but it’s a partial process at best. Chicago has it’s alleys to hide the trash bins, NYC picks it’s sidewalks clean of trash bags every morning, but Mumbai has not yet found a solution that works for its overwhelming scale and complex street life. I have a separate mobile phone here, an old Nokia with a Mumbai SIM card in someone else’s name because you have to be a citizen to get a phone number. I also carry my iPhone for internet access since it has an unlimited international data plan. Only one person has ever legitimately texted or called me on my Nokia, but every day I get at least 3 spam messages. This never happens in the US, and thank god since we pay for our incoming texts and calls on most plans. Everything incoming is free here, but this is still super annoying. It’s to the point where I don’t even check when I hear that I got a new message since the signal to noise ratio is so high. When I first got the phone I was getting these spam messages along with lots of daily trivia: questions about India mythology, celebrity quizzes, and riddles. I thought these were spam at first too, but a co-worker showed me how you could turn them off through deeply buried settings in the phone. Oddly, I’ve been told that many people actually like these messages. Maybe it has to do with the mobile being the primary source of connectivity and information, like how getting physical mail used to be exciting even when it was just a mass mailed catalog. The other fun thing is that I’m having to learn T9 texting all over again. I’m crazy slow and have regained empathy for my old-school friends who respond to my long, grammatically correct texts with a simple “k”. I think I’m transitioning pretty well to Bombay. I’m trying to do something new each today, from walking new streets to finally ordering food from a stand. When I first arrived, the overall urban fabric and street life was so different from what I was used to that I literally couldn’t read it. I didn’t know the signs, the cues that every city and culture has to establish what’s normal and what’s out of place. I know that I’m still missing the majority of the vocabulary, but things are starting to become legible. The biggest way I’ve noticed this is that I’ve started to perceptually filter. We all do this normally every day, since the majority of the things in our environment are expected and repeated. But when I first arrived I was paying attention and focusing on everything all at once, which is pretty exhausting. Sorry for the window glare, but the photos above are from the new IDEO office in Bandra, with downtown Mumbai in the distance in the first photo. It’s a raw space in a new building, and today we started working with an architect to design and build it out. I’m not sure if it will be complete by the time I leave, but I think it’s going to be a great space. Last weekend, my first in India, I went on a hiking trip with some of my co-workers. The mountain was roughly two hours east of Mumbai, with a tiny village at the base where we parked the car and set off in the rain. We trekked 3 hours up and 3.5 coming down, with rain alternating between downpour and clear skies every 20 minutes or so. The ultimate goal was to reach the Kalavantin Pinnacle, an ancient lookout at the top of the mountain that used to protect a fort. The first leg of the hike was pretty casual with a well marked and sizable trail. On the plateau, about halfway up, we had an amazing view of the village down below. Over half a dozen waterfalls gushed along one side of the mountain, flowing more than usual due to the rain. On the flat top there were a few houses and a school before the final ascent upwards, which was much more steep and treacherous. Eventually we made it to the base of the final pinnacle, which is where I had to call it quits. The final climb included carved steps, so I thought it was be manageable, but the stone was extremely slippery since it was raining and the drop-off was straight down 500 feet. My nervous stomach wouldn’t let me hoist myself up the slippery steps that were as high as my chest in that rain. The second photo below was taken by my colleagues who did have the guts to go all the way up. Oh yeah, and I saw a wild monkey! Overall this was a pretty amazing experience and a great introduction to the Indian countryside. More photos are on Flickr.